August 2018, announcing PyMini software release 2.7. This release provides gantry support for CNC routers. One coordinate can be slaved to more than one axis. For example the Shapeoko 2 uses two stepper motors for the Y axis. With the rt-stepper dongle one can drive both stepper motors by slaving the Y axis to the A axis instead of hard wiring the two stepper motors in parallel. See the new COORDINATE parameter in the Axis section documentation. February 2018, announcing a new rt-stepper dongle REV-2. This dongle has a separate RJ-11 connector which provides a modular way of connecting the rt-stepper sensor kit, limit switches and two digital outputs. This new hardware is backward compatible with old hardware and works with the current software. Plus the new dongle is more than 20% smaller, see the new dongle on the left compared to the older dongle on the right. December 2017, announcing PyMini software release 2.6. PyMini now supports spindle synchronization for G33 and G76 threading commands. Synchronization requires INPUT0 index pulse and dongle FW 1e. CAM support for threading is available with Fusion 360 using a custom post processer. See the threading sample code using Fusion 360. September 2017, announcing PyMini software release 2.3. Made a user functionality change to Absolute Jog in PyMini. When in Absolute mode the Jog buttons are now defined +/- similar to the Increment buttons. Use the "-" button to jog in the negative direction, the "+" button will jog in the positive direction. Made changes to the PyMini backplot panel in order to make the tool path display more accurate. Backplot panel now supports circular commands G3/G2. Before they displayed as straight lines. August 2017, announcing PyMini software release 2.2. This release provides the following new features. The GUI can now display spindle speed in RPM. Spindle speed can be measured by connecting a index pulse to the rt-stepper dongle INPUT0 pin. An appropriate index pulse can be generated with the new rt-stepper sensor kit. The kit provides all the necessary hardware for mounting to a Sherline spindle motor. New updated rt-stepper dongle firmware (FW 1d) provides support for spindle speed. The GUI now provides a Tool Offsets screen for lathe parameters. This option is enabled in the rtstepper.ini file. The rtstepper.ini file now uses the Sherline mill as default settings. April 2017, announcing PyMini software release 1.18. Added support for Auto/Run cancel which will execute a synchronized stop. Once the last move has completed you can restart the gcode program without an All Zero command. This different from the EStop button which executes a un-synchronized stop. February 2017, announcing PyMini software release 1.16. The Windows PyMini download now comes bundled with Python 3.5. This means all the PyMini software for Windows is contained in a single zip file. Windows 7 rt-stepper driver is now a separate download. Window 8 and Window 10 require no driver install. March 2016, announcing new updated firmware for the rt-stepper dongle FW 1b. The rt-stepper dongle is now plug-and-play compatible with Window 8 and Window 10. This means no driver install is required. Just plug in the dongle in and start using it with PyMini software. Except for the new embedded Microsoft support the dongle is functionally the same as the old dongle. March 2015, announcing the new PyMini software release 1.0. PyMini replaces the old existing rt-stepper software. This new release is python based and replaces TkMini which was written in TCL/TK. PyMini takes advantage of newer software components and provides an upgrade path with new OSs. This release provides the following new features. Full Python 2.7 and Python 3.4 support for PyMini and plugin scripts. Faster gcode execution with multiple step buffer support. No pauses between gcode commands in Auto mode. GUI is written in pure python using the standard python distribution, no other dependencies. GUI has the same look and feel in Linux, Mac and Windows. General digital output support (spindle, coolant, etc) using a separate Arduino Uno board. September 2013, announcing rt-stepper software release 2.0 This release provides the following new features. Python script support for mcodes. General digital output support (spindle, coolant, etc). The python interpreter comes built into the rtstepperemc library, no new dependencies. Now users can customize their mcodes via python scripts. Standard python scripts are installed with the software for spindle and coolant mcodes. Homing is also supported with python scripts. See the ERS for more information. September 2012, made a significant speed improvement executing gcode. Command motor moves are now double buffered. The trajectory planner will create a step buffer for each gcode line. While one step buffer is being executed by the rt-stepper dongle the trajectory planner will create the next step buffer. This means back-to-back gcode lines will execute faster. Previous support only used one step buffer. July 2012, added support for ACTIVE_HIGH step/direction logic in the .ini file. This will allow support for Gecko G540 CNC controller boards. Previous support was ACTIVE_LOW step/direction logic only. 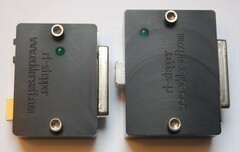 April 2012, I now offer the rt-stepper dongle without the case. You can still buy the dongle with a case, both options use the same circuit board or PCB. The PCB comes fully assembled and tested. Instead of making the printed circuit board on my mill I ordered a batch of PCBs (REV-1) from DorkbotPDX. The PCB is a stellar quality 2-layer lead free purple board with soldermask and silkscreen on both sides. With the new 2-layer board I now support three IO inputs instead of one - INPUT0, INPUT1, INPUT2. All three inputs can be used to signal a estop.